Unless you have been living in a cave for the past few years, you must have heard of the paleo or primal diet. It's the diet our ancestors used to have which consisted mainly of fish, grass-fed pasture raised meats, eggs, vegetables, fruit, and nuts. To me, it is not so much important what the paleo diet allows, as to what it excludes: that is all grains, legumes, dairy products, refined sugar and salt and processed oils. The foods that are excluded are the ingredients that convenience foods are made of: pasta, pies, cakes, sweets, crisps, chocolates, ice cream ..... It's all the sugars and starches that are off the plan. They are the ones that play havoc with people's metabolism. They are the ones that lay the foundation for all lifestyle diseases. The restricted list of permitted foods make it easy to lose weight and to keep it off. In all those moments when you used to grab one of the above mentioned convenience foods, you have to find something else. It takes planning, perhaps a bit more home-cooking. You gotta be prepared for snack attacks. Perhaps you have to change your eating habits altogether, in terms of meal times and portion sizes. Perhaps you will feel more comfortable with three square meals that get you through the day instead of constant calorie-counted little snacks that make you look for food again a couple of hours later. Your body will be grateful and your overall well-being will improve drastically, as you suddenly won't feel bloated, sluggish and tired: feelings that you got used to over years or even decades. Only when they gone, you will realize how much they dragged you down. My latest favorite paleo dish happens to be vegan too. A combination that I like the most. 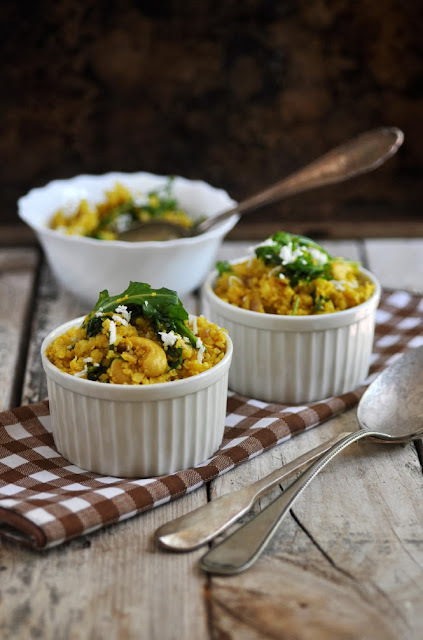 It's cauliflower rice, spiced with a variety of anti-inflammatory spices and some green leaves stirred in at the end to add some color. I have been making this dish numerous times in the past few weeks. It's the perfect lunch, a good salad to accompany BBQ, or can even be used instead of a grainy side dish. It can be made in big batches as keeps well in the fridge. It's good hot or cold. Most importantly, I put it in front of my grain-loving husband and let him taste. For nothing in the world he would have guessed that it was cauliflower he was eating. Now that the dish has been approved internally, I will dish it up for our BBQs with friends over the Dubai winter. I bet it will be a winner. In a food processor, pulse the cauliflower florets until they have the size of rice grains. Alternatively, grate the cauliflower on a handheld cheese grater. Set aside. In a skillet, heat coconut oil over medium heat. Add chopped onions and fry until softened, about 3-4 minutes. Add in spices, then stir in cauliflower rice until it has taken on the color of the turmeric. Add cashews nuts and coconut milk. Simmer over medium low heat for about 10 minutes, or until all liquid has been absorbed. Take off the heat and stir in rocket leaves and parsley. Let stand for a few minutes until wilted. Ready to serve.